President of the Institute of Chartered Accountants of Sri Lanka (CA Sri Lanka) Mr. Lasantha Wickremasinghe recently underscored the importance for companies to ‘redefine, re-strategize and modify ’ their business models which, according to him, will not only help ensure the long term success and sustenance of organisations, but will also contribute towards achieving the growth objectives of the country. 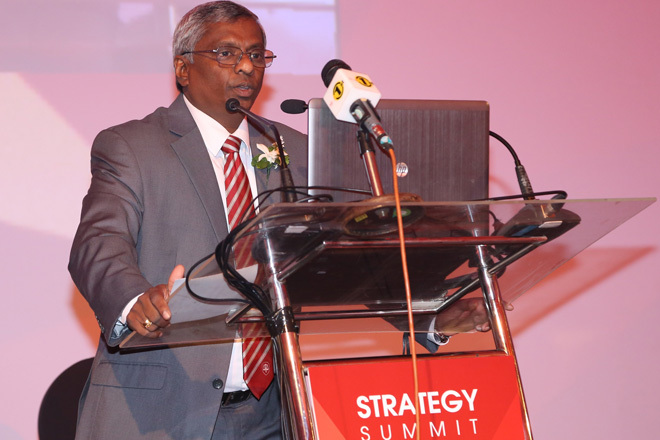 Addressing corporate leaders at the recently concluded Strategy Summit organized by CA Sri Lanka, Mr. Wickremasinghe said that the past decade has been a very challenging one for most countries and businesses due to a number of factors including the financial crisis. “The financial crisis taught us many lessons and it was also a turning point for many of our corporates, including in Sri Lanka,” he said. Mr. Wickremasinghe said that the crisis also made companies reevaluate certain factors, and since then redefining the organization’s strategy has become increasingly important to ensure it’s survival as well as success in these challenging times. “There is an increasing need to redefine, modify and re-strategize businesses,” he said. In the backdrop of Sri Lanka facing renewed infrastructure and economic development, he called on the professional community including business leaders to play a very important role to help take the country forward so it could achieve its growth objectives. “We have to join hands and drive our country forward. Because each and every one of us are responsible to ensure that our nation achieves its growth objectives,” Mr. Wickremasinghe added. Mr. Heshana Kuruppu, Chairman of the CA Business School said that the summit was the biggest forum in Sri Lanka that brought together a large number of business leaders to discuss business strategy. “We believe this is an event that brings together leaders of corporate Sri Lanka to push the limit of corporate thinking,” he said. The participant profile comprised of over 250 senior corporate leaders, including Chairmen, Managing Directors, CEOs, General Managers, COOs, CFOs as well as other senior finance and functional heads. “As the national body of accountants, we thought it is our duty to be the catalyst and organise this summit for the second successive time to enhance the knowledge of business leaders to ensure the progression of corporates in Sri Lanka,” Mr. Kuruppu added.